Palmer Johnson Morot Yacht built by Palmer Johnson and designed by Don Shead This is a bespoke Palmer Johnson build along the lines of Sunseeker Predator or Princess V series. An very fast aluminium"sports" cruiser with a rather unique CODAG power system. If you are looking for a 25M sports yacht that represents incredible value then please contact us for a full e-brochure. This is a very special yacht combining the talents of Dan Shead (Sunseeker designer) and Palmer Johnson (known for the very high quality builds). Twin MTU diesels and a jet turbine combine to offer a unique yachting experience. NOTE - February 2016 price reduction from Eur 995,000 to a new incredible asking price of Euro 750,000 VAT paid and a further reduction to Euros 495,000 OCI CIORNIE is a truly unique motor yacht and at the time of her launch almost visionary. The result is an extraordinary design and build with a budget allowing for an incredibly detailed and lengthy design and build process. This is a yacht for an owner looking for something very different. The engineering is seldom if even seen on a private yacht and would appeal to someone who knows and understands out of the ordinary thinking. The deck layout works very well as essentially the saloon and forward outside spaces are one level. The interior of the main saloon have design nods to vintage aircraft design and build which is spectacular. There is, perhaps, some work to do to the sleeping accommodation which could benefit from some updating together with a modification required to the owners cabin for a double berth arrangement. OCI CIORNIEis equipped with a CODAG system composed of two diesel engines coupled to two waterjets through a reduction gear together with a Lycoming gas turbine. The gas turbine is coupled to a surface propeller through gear reducer and power is transmitted to an Arneson drive. The system is based on that developed for use on naval ships. The objective was to build a boat capable of achieving the highest performance in terms of speed achievable at the time of the project. Combined diesel and gas (CODAG) is a type of propulsion system for ships which need a maximum speed that is considerably faster than their cruise speed, particularly warships like modern frigates or corvettes. The owner was a man at the forefront in the use of innovative technologies and the combination of its demands with the genius of the famous Don Shead and the professionalism of the shipyard Palmer Johnson have created a unique product and at the same time a yacht that is really very special. United Yacht Sales New Jersey would love to guide you through a personal showing of this 82' Palmer Johnson Pj 25 1999. 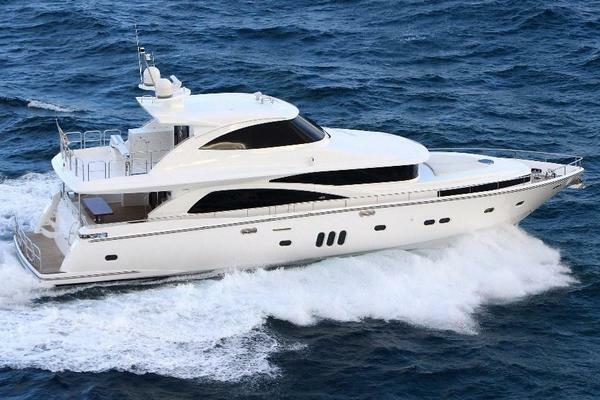 This yacht for sale is located in ROME Italy and priced at $249,000. For a showing please contact us by filling out the form on this page and we will get back to you shortly! 8 guests in 3 staterooms and 4 crew in 2 cabinsSaloon:Open plan saloon area with seating area aft, moving forward to galley area with stowage areas and forward to helm position. Access provided for lower accommodation via stair well and three opening doors to aft cockpit, side decks and forward cockpit.2 x sets ships clock, barometer and hydrometersOther Living Areas:External seating area outside and forward of main saloon. Table provided for al fresco dining. Small aft cockpit with access to saloon and aft deck for stowage, mooring and access to passerelle and bathing platform.Owner stateroom:Two single bunks with small deck and chair and aft access to shower and heads. Please note, the current arrangement could be reconfigured to provide a double bed if required.VIP Stateroom:Forward with V berth providing 2 singles and ensuite shower and heads compartmentsGuest stateroom:Two guest cabins with twin bunks and ensuite head and shower compartments.Crew Accommodation:Two crew cabins with bunks, seating area with table and heads compartment. Aft end of crew cabin provides engine room access and also stair access to saloon.